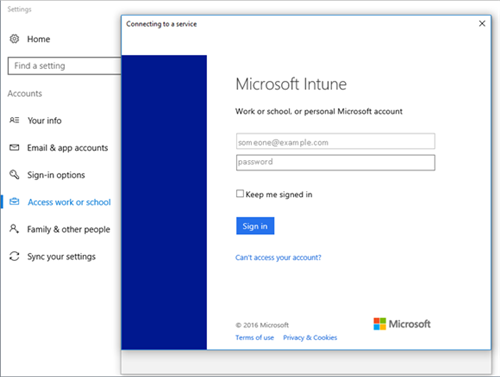 Use Intune Company Portal to enroll your Windows 10 device under your organization's management. 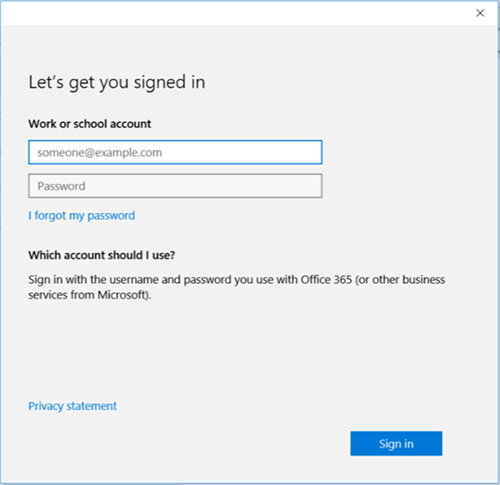 This article describes how to enroll devices with Windows 10 version 1607 and later, and Windows 10 version 1511 and earlier. Before you begin, make sure you verify the version on your device so that you can follow the correct steps. Windows 10 is supported across various device types including desktop, phone, and tablet. The enrollment steps are the same on whichever device you're using. However, your screen may look a little different from the images shown in this article. These steps describe how to enroll a device that runs on Windows 10, version 1607 and later. Go to Start. If you are on a Windows 10 Mobile device, continue to the All Apps list. Open the Settings app. If the app isn't readily available in your apps list, go to the search bar and type "settings." 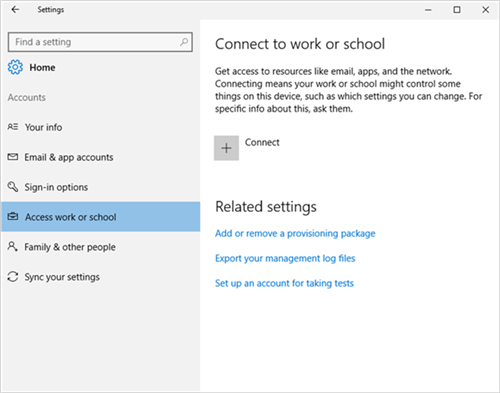 Select Accounts > Access work or school > Connect. Enter your work or school email address, and then select Next. 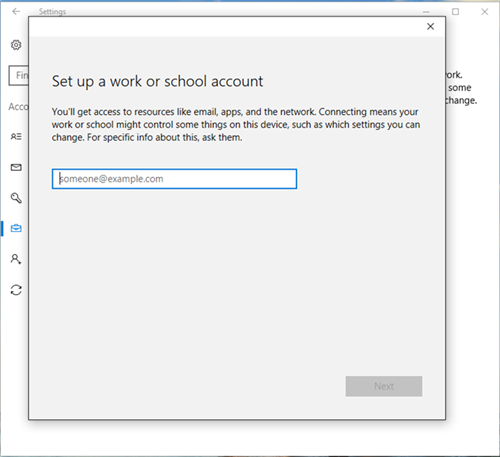 Sign in to Intune with your work or school account. You’ll eventually see a message that your company or school is registering your device. 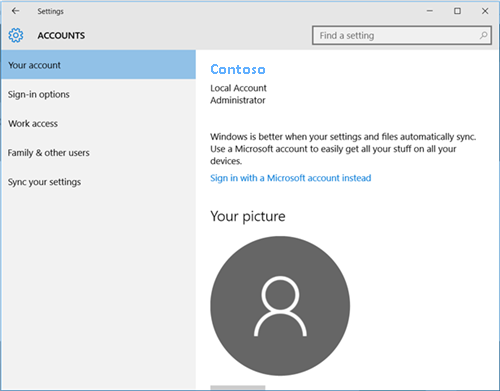 If your organization requires you to set up a PIN for Windows Hello, you'll be prompted to enter a verification code. Enter the code and continue through the on-screen steps to create a PIN. On the You’re all set! screen, select Done. Your device is now enrolled. 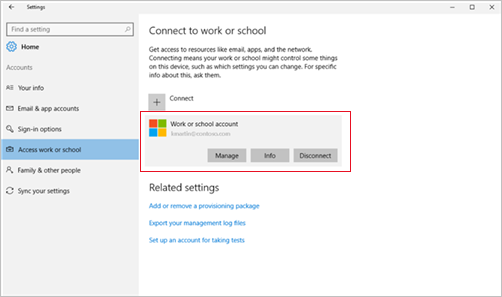 To double-check your connection, go back to Settings > Accounts > Access work or school. Your account should now be listed. Still can't access your work or school email, files, or other data? Learn how to troubleshoot account problems. These steps describe how to enroll a device that runs on Windows 10, version 1511 and earlier. Select Accounts > Your account. 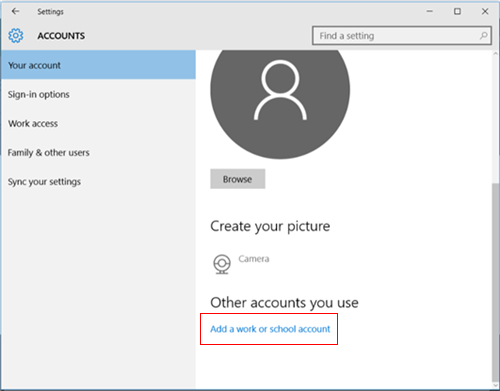 Select Add a work or school account. Sign in with your work or school credentials. To get help, contact your company support. You can find your organization's IT information on the Company Portal website. Sign in to the site with your work or school account.